A great piece for collectors and non collectors alike, a Shakudo worked Box made from the furnature parts of a Samurai's Sword. 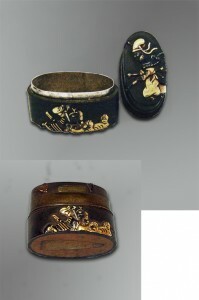 Bronze with silver insert and gold Shakudo work is a great piece of art but the rarest aspect of the box is the design work which displays a Samurai fighting with a tigre on the base and another Sumurai on the top rushing with weapons drawn to assist. More commonly Samurai sword furniture uses some manor of flower design in its theme. To show such an action theme is certainly rare. Using two parts of the Sword Furniture to form a box, called a Fuchi-Kashira Box from the name of the parts was a way of celebrating the life of a Samurai.